Just ordered the Q2's and was going to get my wheels painted. Which color, black or gold to match the brake calipers? The bike is black with polished frame and I think it would be too much black. The wheels are currently black with polished lips, which I don't like. Black, unless you're 65 and up. In this case, you can go with the gold. Lol Jack, just turned 45 but I think it will be too much black. Or, how about a bright yellow? That will get ya noticed! I always thought an electric blue looked cool on a black bike too. Yellow wheels are faster, too. 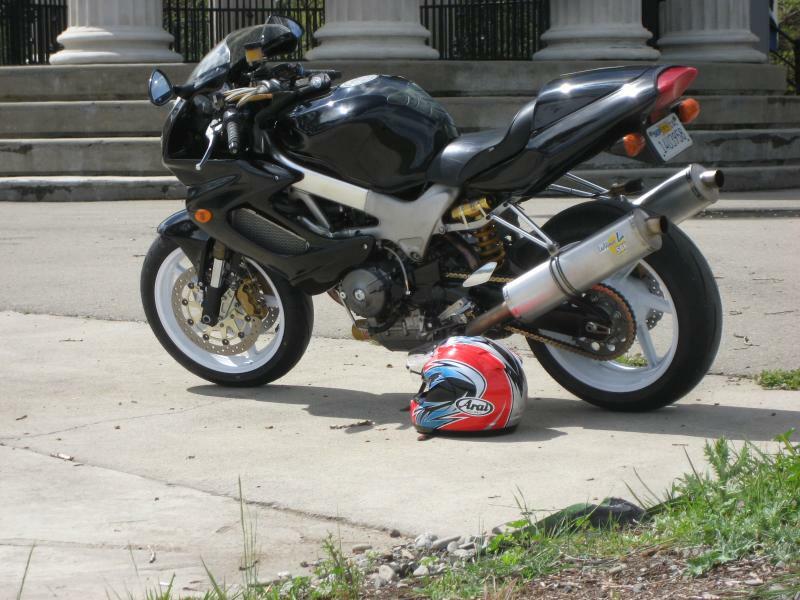 Actually white will go well with a black bike with few white stripes on teh bike it will even look more slick. Yeah you could play around with those vinyl pin stripes all day. Rolls of that stuff are pretty cheap at auto parts stores. I painted ALL of the circles yellow on my bike. Can't take any chances with that sort of thing. Are yours painted or powdercoated? Reason I ask is my yellow wheels get dirty real quick, but because they're powdercoated they are deceivingly easy to clean. I believe the bike I'm trying to find belongs to an Aussie who purchased it this way. Might be a street fighter VTR. Thats a good looking superchicken you got there.. I really do like the way the 6 spoke wheels and USD forks make the bike look. 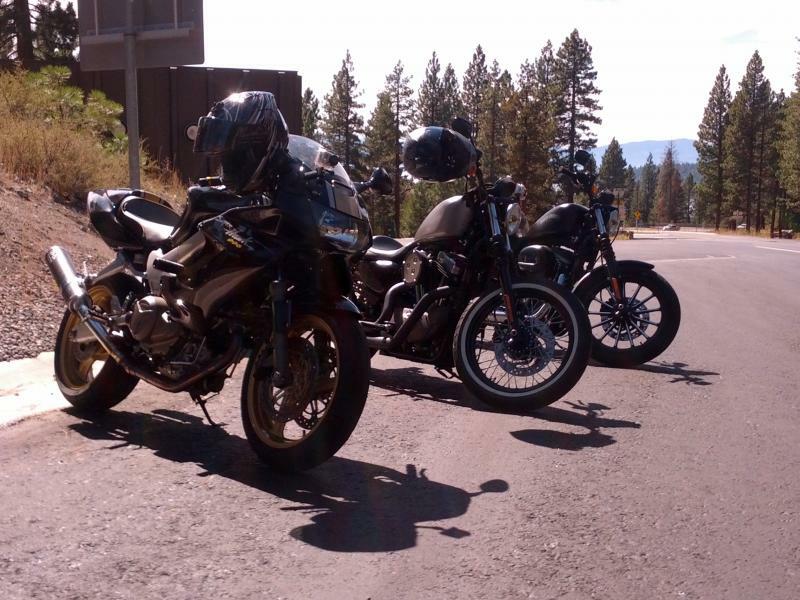 That's one's not mine, that's 8541Hawk's bike, or at least one of the paint scheme's he's run. But a front end swap is relatively easy... you just have to do a lot of prep work and purchasing of all the components. The actual swap can be done in a day (if you go with a documented one so you know which spacers/bearings/etc you will need). 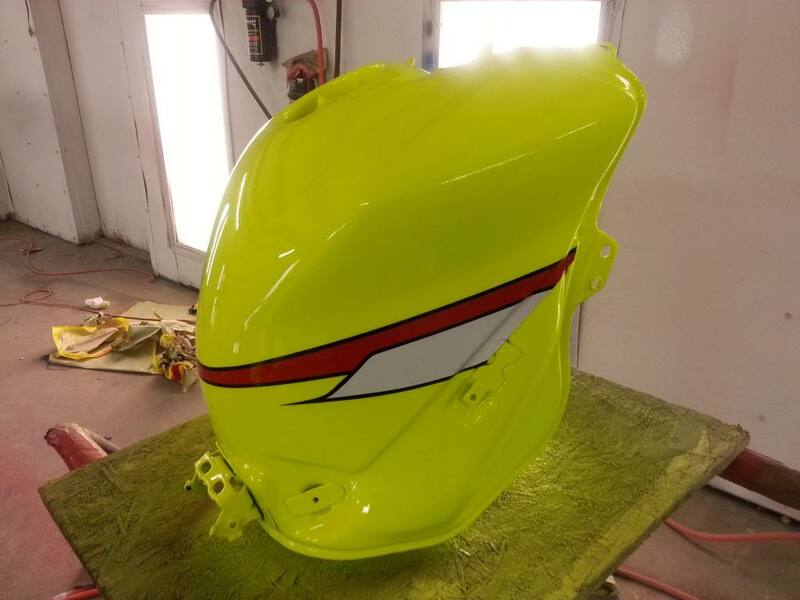 Or I could go with the Yellow Hi-liter look that my friend paints his race bike! Yep, that is what I meant, Mikes bike!!! Mike, we miss you here! Man!! You have no ideal... Mike's bike handles like a dream... hes suspension is by far the best I've seen, it also sounds really good and for 95k miles the engine couldn't be in better shape.. I wanted to take his 1997 home and leave my 2002 that has 15k miles with him.. He really, really knows what hes doing.... I live an hour a way and when ever I need help I dont mind driving back and forth at all... he also made my cousin 03 r6 running like new again. And mine.. who ever had a problem with him here really messed up..
Go with white, black will be too much. The bike pictured looks classy, clean and well cared for. Sorry late to the thread but I bought gold Marchesini's for my red bike, I'll sent in pic's when the rebuild is done. Quick Reply: Gold or black wheels?